Husband came home from running on the trail in one of our city parks on a recent hot day. I jumped into the car after he used it and OH. MY. GOD. Now I understand why dogs hang their heads out of open car windows. This doesn't happen to Husband because both Lacey and I always smell like flowers after a workout. 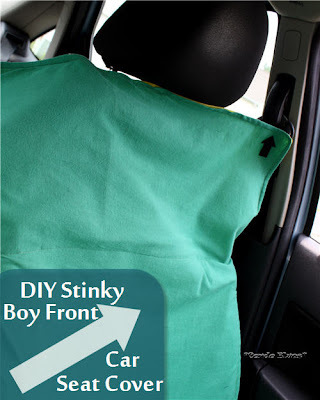 To his credit, Husband tries to cover the car seat with a trash bag he has stashed in the trunk. Well, until I toss the fetid mess and decontaminate the trunk and car. Rinse. Repeat. Old towels don't work either. I need something that absorbs but has a barrier to protect the car seat and is washable. Washable is a MUST. Hey Lisa. 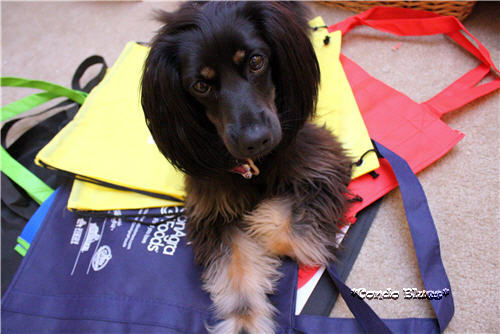 I bet if you sewed these extra recycled bottle shopping bags together, you will have your washable car seat protector. Great idea Lacey! What ever would I do without you? 1. 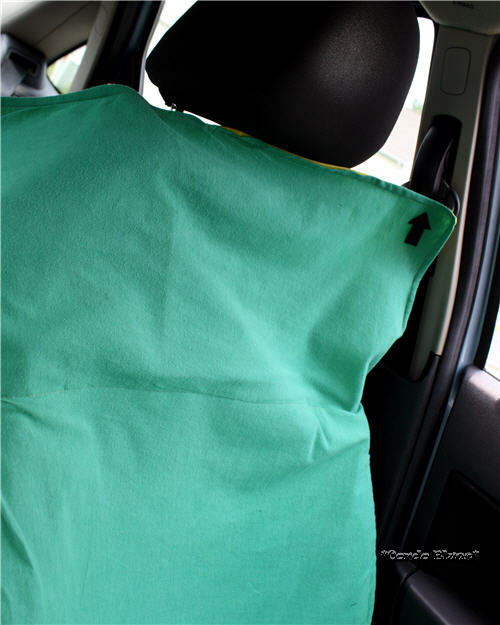 Measure the length and width of the car seat and add a few inches to those measurements. 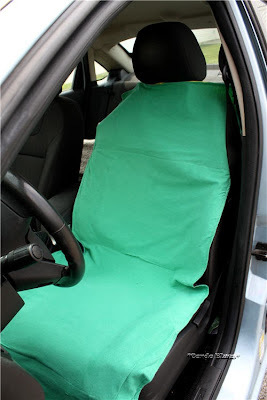 This will make the seat protector hang over the car seat a bit and still protect the car seat if you shift a bit. 2. Cut the handles and bottom off of the shopping bags. 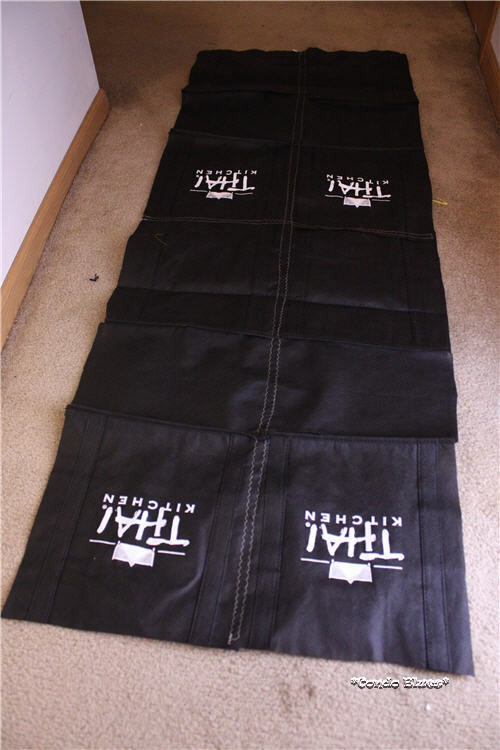 Then cut the side seam so the bag lays flat. The number of shopping bags you will need for this project depends upon the size of the bags and your seat. I used approximately four square bags per seat front seat cover. 3. Make the barrier layer by pinning the shopping bags together and using the sewing machine and thread to sew them together. Remove the pins when you are finished. I used a zig zag stitch to sew my bags together for giggles. A straight stitch works too. 4. Use the scissors to cut the fabric layer the same size as your barrier layer. 6. Use the sewing machine to sew the layers together. Make sure you leave a gap in one of the side seams unsewn that you can turn the layers right side out. 7. Remove the pins if you haven't already and turn the seat cover right side out through the gap. 8. Pin the gap closed. 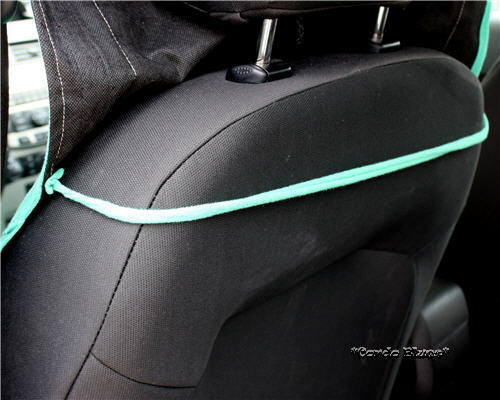 Top stitch around the edges of the seat cover to keep the fabric from shifting and to sew the gap shut. I top stitched my cover twice horizontally for extra stability and make it look a bit more finished. 9. Optional: I die cut an arrow from a scrap of reusable shopping bag with my Sizzix Big Shot and sewed it to the top of the seat cover. I like to play can my Big Shot die cut this? a lot. 9. 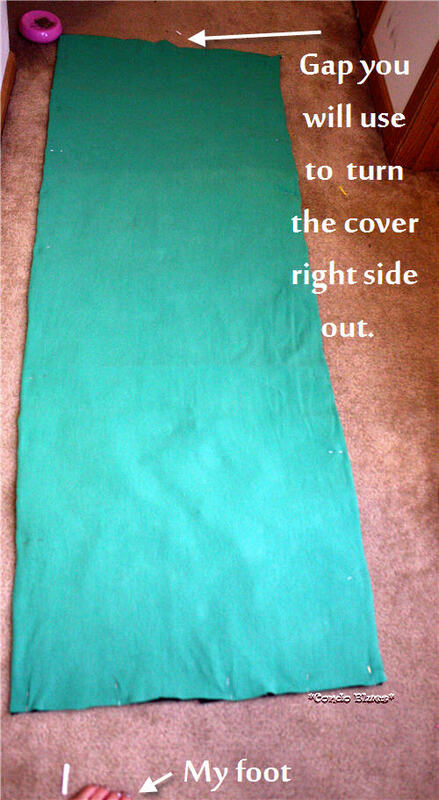 Optional: I sewed a piece of extra fabric to the back of the cover so it won't flop forward when I'm sitting on it. I made four seat covers and keep them in the car trunk. That way, Husband always has one in the trunk if it needs it when I have a used cover in the wash.